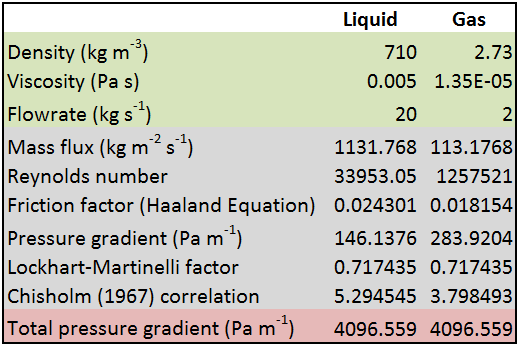 The Lockhart and Martinelli correlation is commonly used to calculate the pressure-drop of two-phase flow in pipe. It's simpler than other methods, and is particularly suitable for low liquid and gas flows in small diameter pipes. First the pressure drops of the individual phases are calculated assuming that each phase is alone in the pipe (i.e. separated flow). Then, the Lockhart-Martinelli parameter is calculated. 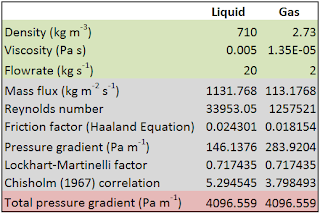 Finally, the Chisholm (1967) correlation is used to calculate the total pressure drop. Hi Sam..Thank you for posting this.